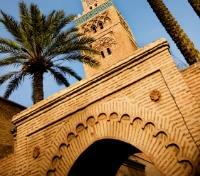 Private guided city and heritage tours of key Moroccan cities. 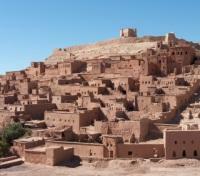 Private guided tour to the High Atlas Mountains. En route to Fes, stop at Meknes, known for its 40 km long walls. 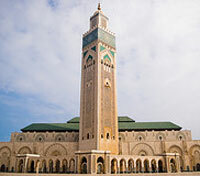 Upon arrival into Casablanca, you will be met on the tarmac by a local representative and escorted through Customs and Immigration, avoiding any queues along the way. Our local representative will provide you with your travel documents and go over the itinerary in great detail. You will be privately transferred between your hotel and Casablanca's international airport by an English-speaking guide & driver. Approximate travel time varies based on the location of your accommodations, taking up to one hour. A breath of fresh air on the oceanfront of Morocco’s largest city, Four Seasons Hotel Casablanca offers a sleek resort-inspired escape – just 10 minutes from the city centre and business district. With modern Moroccan elegance, Four Seasons Hotel Casablanca offers the city’s largest luxury hotel accommodations – efficient for business and relaxing for holidays. The look is fresh and contemporary, layered with traditional Moroccan details and splashed with locally inspired colours. A modern city and the trade capital of Morocco, Casablanca is a magnificent mix of modernism and tradition. It is the largest metropolitan city in the Maghreb and is characterized by elegant buildings, great avenues and unique architectural art forms and Moorish finishing featured throughout the numerous domes and columns. 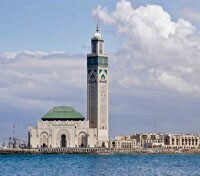 This booming cosmopolitan city is characterized by the King Hassan II mosque located by the sea and featuring a 200 meter minaret that dominates the city's landscape. The Mosque is open to non-Muslims with daily shared tours highlighting it's impressive modern interior. Again, a driver and guide is at your disposal and will provide insight into the best this city has to offer. Entrance to the Mosque is included. A private vehicle with an English-speaking driver will transfer you from Casablanca to Fes. During the transfer, enjoy some brief touring stops along the way, including a visit to Meknes, the famed Ismailia capital known for its 24-mile (40-kilometer) long walls and numerous gates. Next, visit Bab Mansour, an impressive and elaborately decorated gateway that is today a popular arts and crafts galleria. 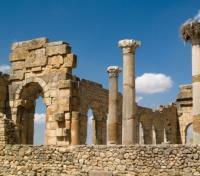 Interestingly, the marble columns seen here were taken from the nearby Roman city of Volubilis. Next, visit the historic Royal stables, the amazing artisan markets and the popular Jewish quarter. Before arriving in Fes, stop in Volubilis and the holy city of Moulay Idriss to take in the fascinating history and scenery. 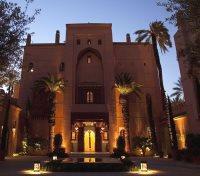 Upon arrival into Fes, you will be delivered to your hotel. 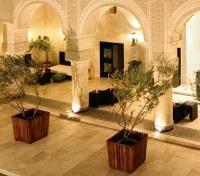 Riad Fes is located in the heart of the ancient city of Fes. It has succeeded in combining refinement with inspiration and invites you to relax and enjoy your stay in a serene atmosphere. The prestigious history and refined civilization of this Imperial city is reflected in the Spanish Moorish architecture and attention to detail seen in the décor. It’s opened Andalous pavilion, and its new baroco-andalous pavilion come to complete the traditional patio with a style even more contemporary and purified to the full satisfaction of the guests who wish to spend some time in the middle of an oasis of harmony. The Riad Fes is 25 minutes away from Fes International Airport and 3 hours by car from Casablanca, Riad Fes is ideally situated at the heart of the medina and in close proximity to its historic monuments. Meet your guide in the hotel lobby this morning, then set out to explore Fes, the cultural and spiritual center of Morocco. Also known as Fes el Bali, this UNESCO World Heritage Site was founded in the 9th century and is also home to the world's oldest university, founded in 859 CE. The city of Fes reached its true economic and cultural height through the 13th and14th centuries under the Merinids, at which time it replaced Marrakesh as the capital of the kingdom. Although the political capital of Morocco was transferred to Rabat in 1912, Fes has retained its status as the country's artisan centre. Workshops hosting master craftsmen in the medina are as busy today as they were hundreds of years ago, and strongly contribute to the city’s industrial economy. Trades such as blacksmithing, leather working, ceramics, silk weaving, and sculpting are still practiced, and you’ll sure to witness this firsthand throughout the day. The tannery of Fes, colorful and pungent, is a must-see; here, workers labor in small pools filled with specific dyes to treat their wares. The original ramparts still protect this ancient city, and its estimated 9,000 passageways and bustling streets are a joy to explore. With a private driver and expert guide at your side, discover the essential highlights of Fes over the course of this full-day tour. Sit back and relax as a privately driven vehicle, with English speaking driver, provides you with a transfer between Fes and Erfoud. En-route you’ll pass through a scenic forest of cedars and across the Middle Atlas Mountain range to the mineral mining city of Midelt, where a stop for lunch is scheduled. This journey continues along through the dramatic Ziz Gorge, passing en-route the ancient, holy city of Rissani. It is here where the one would find the ruins of Sijilmasa, a once capital and merchant stopping locale for the ancient caravan routings of the 8th century. After an approximate 7 hours of travel you will arrive in Erfoud. A 4x4 vehicle will be waiting for you to continue your adventure by heading towards the dunes of Erg Chebbi, possibly the largest dunes in the Sahara desert. 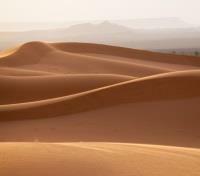 The dunes of Erg Chebbi are a strikingly strange natural formation. On the top of the flattest area you could imagine, suddenly a long mountain of sand rises. This mountain is surrounded by flat and desolate nature on all sides, and you could end up wondering if it really is real. But so it is, even if its existence is so weird that it has given rise to legends and myths among the locals. Upon arrival at the camp you will witness the sunset from over the desert dunes and be astounded by the peace and calm as well as the changing colors of the landscape. Tranquility, clear skies, bright stars, shimmering vistas, intense colors, huge dunes and magical experiences. 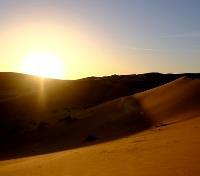 This can all be enjoyed in comfort at the Merzouga Luxury Desert Camps. 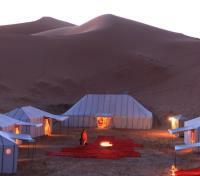 Located strategically in the middle of the big dunes of the Erg Chebi Desert, Merzouga luxury desert camps also offers a spectacular nomadic experience. It is especially unique because of the 'Haimas', which are traditional tents made of camel skin typically used by nomadic people. Rise early this morning for a once-in-a-lifetime opportunity to watch the Sun ascent over the endless sands of the Sahara. Get on the back of a camel at your camp and traverse the vast dunes of the mighty desert until you reach the spot from which you will get a chance to take in the most memorable sunrise. Watch the sunlight play and slowly change the colors of the dunes around you as a new day begins in this beautiful corner of Morocco. A 4x4 vehicle will transfer you back to Erfoud where your private vehicle awaits for your onward journey. Travel today between Erfoud and Skoura with private vehicle and driver. En-route, stop in the Dades Gorge located just southwest of Tinerhir and some 110 km (65 miles) from Ouarzazate. Experience the unbelievable glory of the massive canyon walls reaching some 300 meters (900 feet) high and continuing for some 100 meters (300 feet). 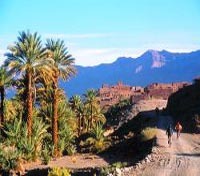 A little north-east of the southern city of Ouarzazate, lies the Dadès Valley-stretching out between the peaks of the High Atlas and the Jbel Sarhro mountain range. Known as 'The Valley of One Thousand Kasbahs', it is the most prominent of the oasis valleys that dominate southern Morocco. 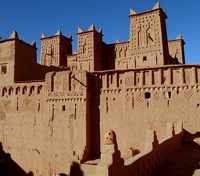 Before reaching Ouarzazate, continue to Skoura - one of Morocco’s beautiful oasis. Skoura offers travellers a chance to rest their weary feet and enjoy the abundance of nature. At first glance from the road, it resembles a sort of thin, long, oasis. However once you get off the road you discover that Skoura in Morocco is very large and that what appeared to be a line of trees is actually a flourishing oasis. Between the peaks of the High Atlas and the gateway to the South Moroccan desert, Ouarzazate paves the way to luxurious oases. Situated in the region of the thousand Kasbahs, the Skoura palm grove is a refreshing stop, a true labyrinth of luscious gardens. In the shade of the hundred-year-old palm trees, hides a dream house which lives according to tradition: almond trees in bloom, festival of roses, date and olive harvests. Guests at Dar Ahlam have a great selection of activities to choose from. Activities vary from season-to-season, and your host will review tour options upon arrival to Dar Ahlam, reserving select activities afterward. 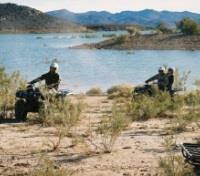 Examples of optional activities include quad or motorcycle riding, camel back riding at sunset, donkey riding in the palm plantation, horseback riding on the edge of the Almansour lake, and cooking lessons. A la carte activities and tours - also available to booked at the hotel – include touring the Valley of the Almond Trees and the salt mines, lunch on the edge of Quarzazate Lake, aperitifs at Ksar Ali, hiking the Sidi Fla Gorges, the Valley of the Roses, the Gorges of Dades, the Valley of Draa, the Gorges of Todra, or the Skoura Palm Groves. Additional fees may apply for a la carte touring. Please speak with your Destination Expert for more information about the tours offered by Dar Ahlam. Travel in a private vehicle with English speaking driver between Skoura and the High Atlas Mountains. This route offers wonderful photo opportunities like the UNESCO World Heritage Centre of Aït Benhaddou, where movies such as Gladiator and Jesus of Nazareth were filmed. Drive through the High Atlas Mountains, across the dramatic Tizi n'Tichka pass from Ouarzazate, a very diverse Moroccan city home to some 40,000 inhabitants. 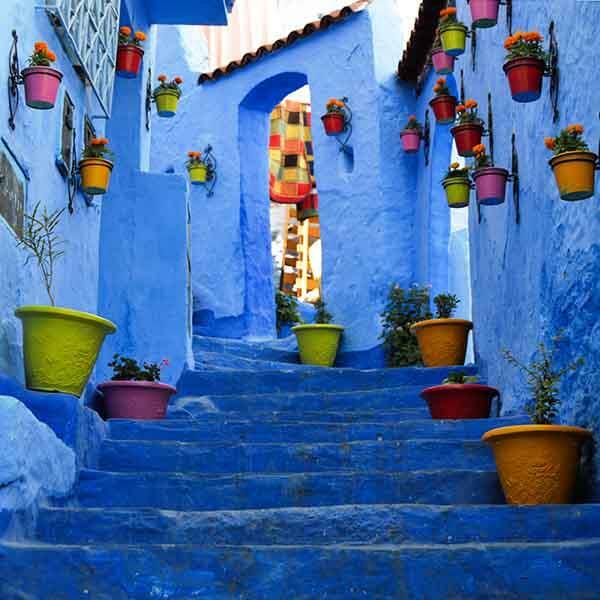 The focal point to this town is the long and wide street Avenue Muhammed V, which begins just before the city starts, and continues along past the Kasbah of Tifoultoutte. Situated in the spectacular Atlas Mountain in Morocco, the award-winning Kasbah Tamadot was brought by Sir Richard Branson during one of his famous ballooning expeditions. 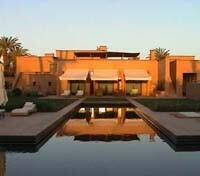 At Kasbah Tamadot emphasis is given on complete luxury and pure relaxation in breath-taking surroundings. 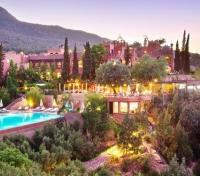 The enchanting Kasbah Tamadot is a perfect blend of tranquil courtyards and pristine gardens encased by ancient walls. Each of the rooms and suites is individually decorated to reflect the beautiful architecture of the building and valuable antiques from all over the world. The property also features a stunning infinity pool, multiple Jacuzzi, plentiful sun-decks, tennis court, and a luxurious spa with full-fledged amenities. 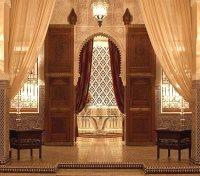 The grandeur architecture, opulent furnishings, warm and welcoming Berber staff makes this place truly magical. 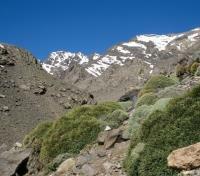 The High Atlas Mountain region offers a wide variety of trekking options and is suitable for visitors of all ages. For those unable to meet the physical demands of a challenging trek with equipment, mule support can be provided. Your experienced guide will accompany you as you explore the trails, providing historical insights about the region and pointing out sights of interest. After few hours exploring the High Atlas Mountains, you will be returned to your hotel. A private vehicle with English speaking driver will provide a transfer between the High Atlas Mountain region and Marrakech. The approximate travel time is one hour. The caleche, a horse-drawn carriage popular in Marrakech, is one of the best ways to appreciate the city. This evening, with the sun setting and giving the land a golden hue, sit back and relax as you are guided through and past ancient ramparts and some of Marrakech’s 22 fortified gates. A particular highlight is Agdal Gardens, where you will saunter through a botanical garden lined with orange, fig and lemon trees. As the sun sets behind the walls of the old city, you’ll begin the return trip back to the city, trotting through Jemaa el-Fna – Marrakech’s most popular square among locals and visitors – to see the marketplace in the heat of night, before making a stop at the souks for an evening tour past the curios, food vendors and craftsmen that have for centuries characterized the souks of Marrakech. After a memorable night on the town, you will be returned to your hotel. Located in the historic heart of Marrakech, the luxurious Royal Mansour Hotel features gorgeous decorations and details courtesy of local artists. 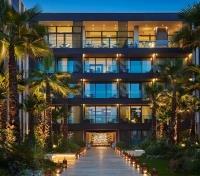 This property was chosen as one of the World’s Top 100 Hotels by the Robb Report. Lose yourself wandering in the riads and alleyways, where every turn leads to wonder as nature and architecture come together in subtle harmony. Royal Mansour Hotel offers individually decorated villa-style riads, each featuring three levels, as well as a beautiful interior courtyard with a fountain. This hotel boasts three restaurants: La Grande Table Marocaine, La Grande Table Française and La Table. Each restaurant is the creation of Michelin Star Chef Yannick Allén. Relax in the Chimney Lounge as you recline by the fireplace while listening to a jazz tune on the piano. Cigar aficionados are invited to visit the Cigar Lounge, featuring fine cigars and digestifs. Visit the onsite spa and discover a plethora of sophisticated treatments, tailor-made and selected for the wellness of your body and mind. Keep active at the fitness centre, equipped with modern machines in a beautifully styled setting. During spare time, visit the library, the mirror-like pool, or wander through the flourishing gardens. 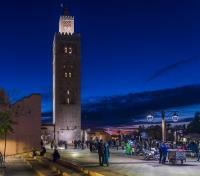 The sweeping and dynamic history of Marrakech – an imperial capital in centuries past – is best appreciated with the help of a private guide. Today, begin your tour of the Ochre City with a visit to the Koutoubia Mosque. Constructed in the 12th century, it’s known for its a beautiful minaret which can be seen from nearly every approach to the city due to a long-standing ordinance that forbids any other building in the old city to rise above the height of a palm tree. 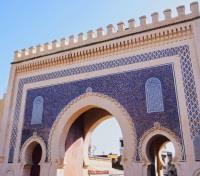 After viewing Koutoubia Mosque, visit nearby El-Bahia Palace. Translated to English, the El Bahia Palace means “Palace of Brilliance,” and this incredible, ornate and meticulously crafted property is endowed with some of the finest ceramics in the country. This 19th century palace was built over a seven-year period for Ba Ahmed, the son of the Grand Vizier Si Moussa. Featuring a trapezoidal garden, tiled courtyard, and many hidden treasures in the form of antique objects d'art and the palace's convergence of Andalusian and Moorish architecture, it is a must-see site. Your next stop is one of most coveted archeological sites in Morocco: the Saadian Tombs. Opened to the public in 1917, they are accessed through a narrow passage which leads to an enclosed garden and into two mausoleums that host more than one hundred mosaic-decorated tombs. The Musee De Marrakech, your next stop, is an important example of Moorish architecture, and the main courtyard and chambers are host to impressive feats of design; elaborate archways, gorgeous stained glass, and a collection of ceramics that are sure to dazzle. Finally, wander through the mesmerizing souks of Marrakesh. With 18 souks selling a dizzying array of handicrafts, textiles, spices, foods, electronics, antiques and everything in between, the souks of Marrakech are the perfect place to find a keepsake to bring home, or to simply get in touch with day-to-day life in the Red City. Enjoy a guided walking tour through the Gardens of Majorelle, a property acquired in 1922 by painter Jacques Majorelle. After spending nearly 40 years creating his “Ochre City”, the ownership of the garden changed to the families of Yves Saint Laurent and Pierre Berge in 1980. An oasis in the city, the expansive gardens feature an impressive collection of cacti, exotic plants and unique tree species carefully placed to emphasize their beauty. Pools, streams and fountains add to the charm, as does the birdsong of the many winged creatures that call this place home. Carry on to the Gardens of Menara; an area which has in its center an immense pool dating from the 12th century. At the edge of the water, among the various plants and olive trees, is a small Saadien house which over the last century has been rebuilt and resorted back to its original beauty. Enjoy the remainder of the excursion exploring the nearby monuments that surround the gardens. After exploring the gardens and Yves Saint Laurent Museum, you’ll make the 20-minute drive to the nearby Palmery Museum. Featuring exotic plants and flowers, impressive sculptures and works of art, it is a joy to explore. Once you have had ample time to tour the Palmery Museum, you will be returned to your hotel. 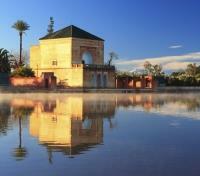 A private vehicle with English speaking driver will provide a transfer between Marrakech and Casablanca. The approximate travel time is 2 hours and 30 minutes.